[amazon_link id=”B000NXTHJY” target=”_blank” ]Stellaluna[/amazon_link] was one of the first children’s books that entered my home when I gave birth 12 years ago. It was a gift from a very close childhood friend, and I cherished it. The message of tolerance and acceptance is so sweet, and I have often repeated giving this very gift to other families. 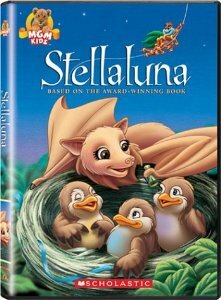 I was excited to receive [amazon_link id=”B00018YC2S” target=”_blank” ]Stellaluna[/amazon_link] DVD. The spider and toucan characters are not in the book, and I am not really sure how they fit in. They do try to maintain the theme of self-acceptance; however, I am a purest when it comes to this beloved story. I hate to see it tampered with at all.